Steiff Limited Edition Selection Swarovski Felt Dolphin 035487. 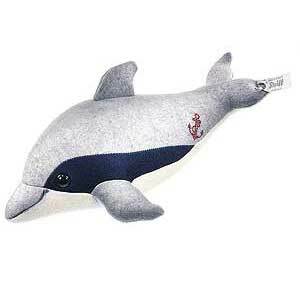 This lovely Dolphin is hand made in, grey, navy and white wool felt, by Steiff. He is 30cm long and on his body, he has red Swarovski crystals in the shape of an Anchor. He comes Boxed with numbered certificate. Made of the finest high quality wool felt with synthetic filling and safety eyes. Surface washable only. Limited edition of 2.000 pieces worldwide, with silver-coloured "Button in Ear" .